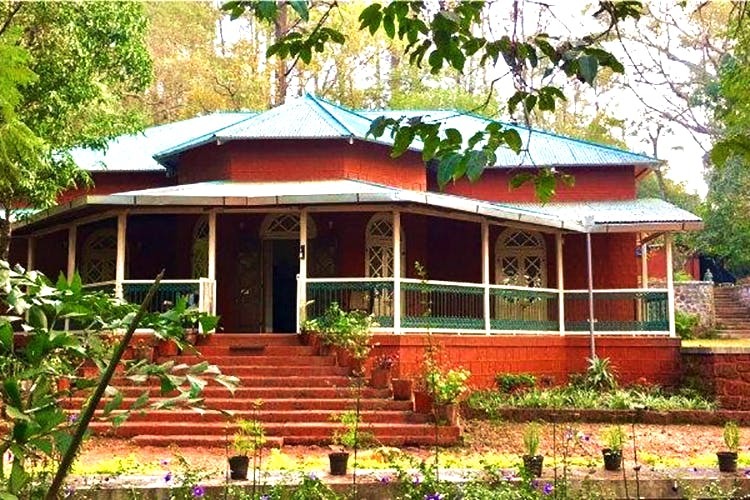 Located at the heart of Panchgani, Rock Side Villa (three hours from Pune), boasting of its orange brick exterior, white arched doors and a quaint front porch, is a quintessential heritage home stay perfect for your weekend getaway with your big gang! Once owned by Abbas Ali, the Nawab of Wai, this 1940-homestay, today belongs to Heta Pandit. On a bright sunny day, Rock Side Villa, standing tall on two-acres of land, amidst tall hill trees, looks like something right out of a beautiful postcard! The interior decor is everything archaic and pretty- a living room with erstwhile furniture and cabinets, a minimalist dining room filled with carefully placed antiques and knick-knacks and a kitchen that opens up into the backyard of the bungalow. The house has four bedrooms and can accommodate up to 10 guests at a time. Keeping true to its theme, the rooms have four-poster beds with canopies and tidy white sheets, mud-brown chairs and a wooden wardrobe. The staff will cook you mouthwatering meals for an extra charge, and if you’re up for it, they can also arrange for a barbecue session on the veranda. Remember how you’re always searching for a spacious place to chill with your friends? And, fancy hotel rooms weren’t making up for it? Well, Rock Side Villa at Panchgani, away from all the city chaos, is the perfect answer to everything!